a challenge to make time count, to number my days and be wise in the fast life of this digital age. I need disciplined (root word: disciple or learner) time with the Time-Maker. Like Josip Lasta, the Croatian pilgrim in Michael O’Brien’s book Island of the World, I want to keep walking towards the timeless One Who Comes to Us On the Waters of Time (a title taken from a line in his selected poems at the end of this book). My Vessel Series is inspired by these poems as well. You can see most of them on my Web site (http://gracecarolbomer.com/section/297681_Vessels.html). Nine of these are at a gallery in Roswell, GA, called MUSE&CO. 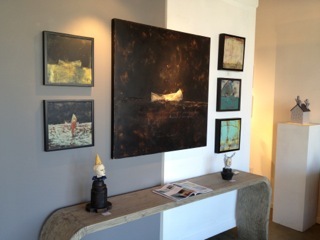 Below is a photo taken there of my gallery space (http://www.musecofineart.com/artists/grace-carol-bomer/). Currently I am working on several new large pieces. Two Vessels above is finished (40 x 40 inches oil/cold wax on panel). 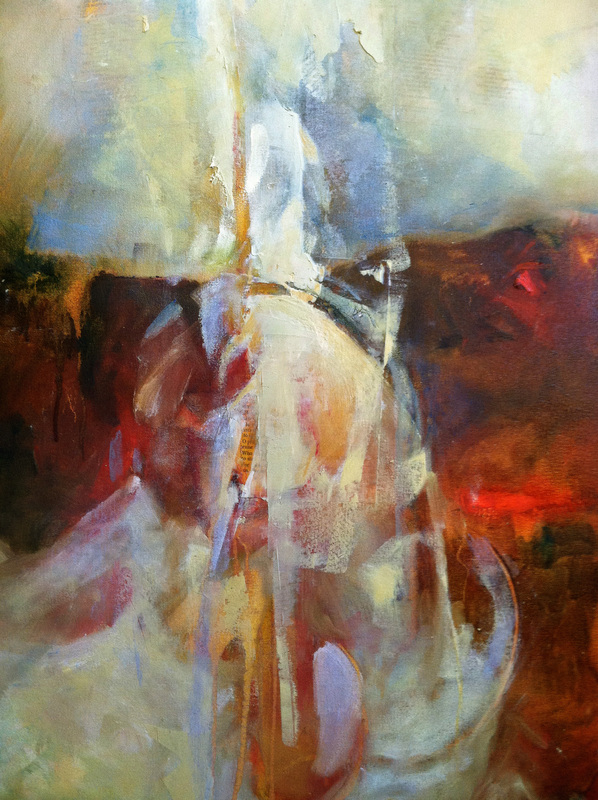 The under-painting at the top of this piece includes red, an important color in all my paintings. Red signifies the life-blood, be it a small stroke of cadmium or a red under-painting covered by the final layers. The top vessel in reds hovers above a horizon (horizo–the line separating heaven and earth). 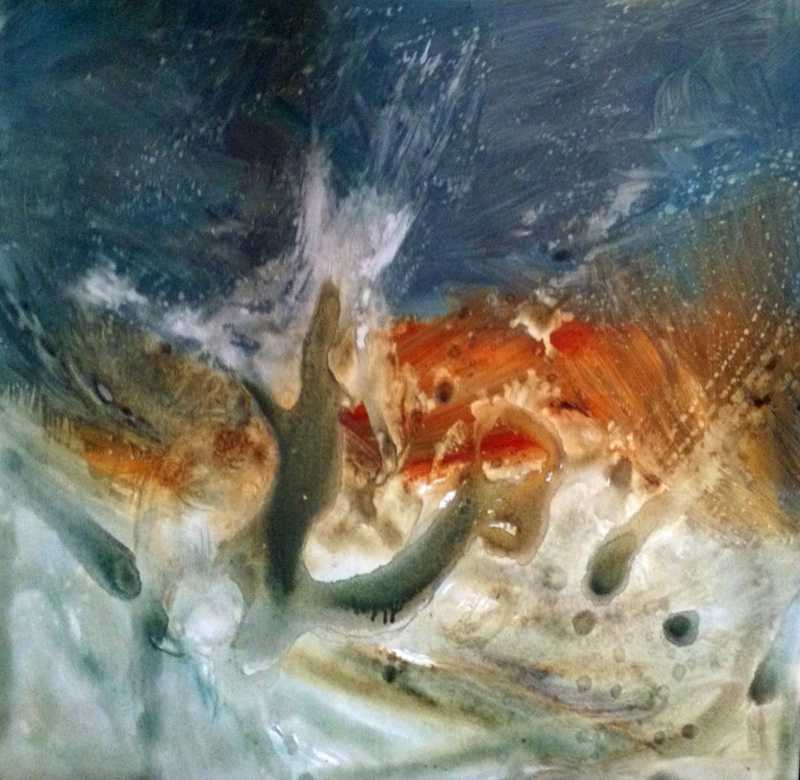 I do not want to explain my paintings too much, because they have a “life” of their own. What do you see in Two Vessels? (This question sounds a bit like the question asked in The Life of Pi (see below). 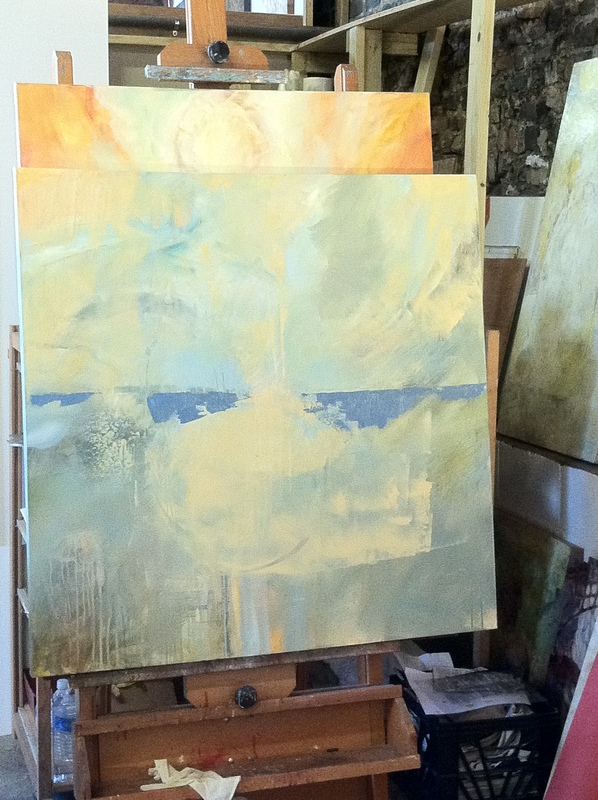 The piece on my easel and the 36 x 36 inch canvas next to it are not yet finished. A vessel is emerging in the first one. The other ….. I will keep you posted on how these two paintings evolve. 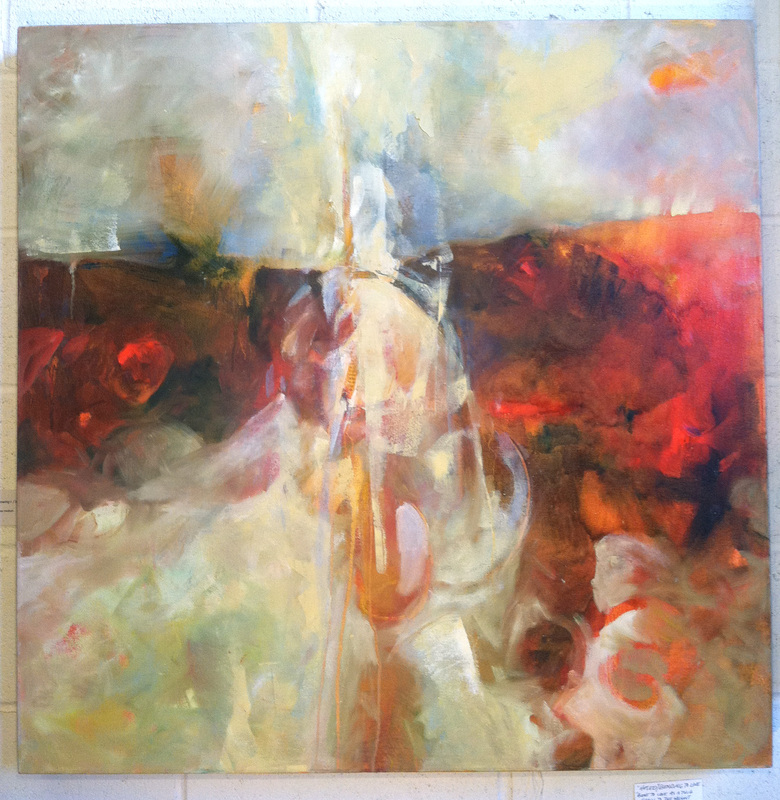 I did resolve the center of this 36″ x 36″ painting this week. I saw a figure or even figures (see detail at right, below), and was reminded of The One who Came on the Waters of Time. (Is this title becoming a series? See my first and second post which refer to my vessel theme and this title.) See https://gracebomer.wordpress.com/2013/01/11/faith-study/. 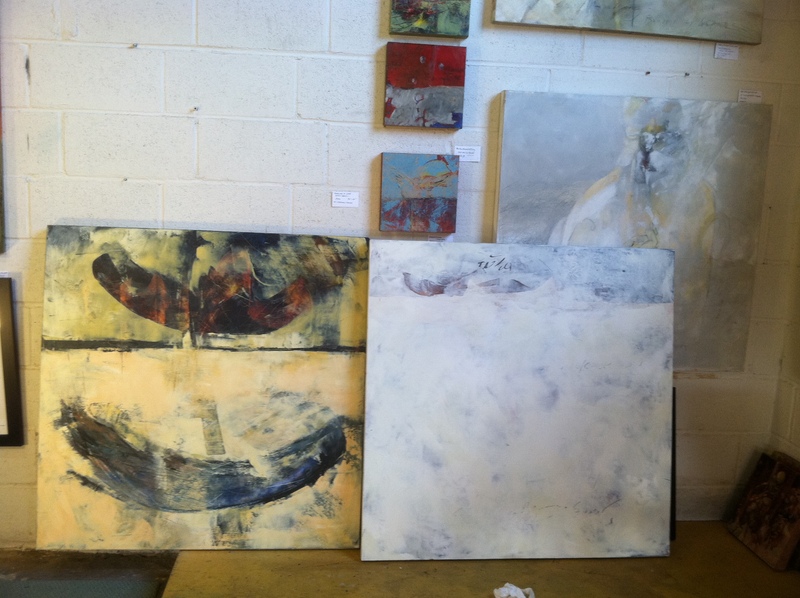 Or please come visit me at 140 D Roberts Street to see these paintings in process and in person. on a sea-wind carries us. as this frail vessel dives beneath. your port is near, your home is there. This entry was posted in Shows and Galleries and tagged arts, cold wax and oil paintings, Entertainment, fast paced life, Gallery, Inspiration, Michael O'Brien poem, movie, Muse&Co, Os Guinness, Painting, Poetry, poetry influences painting, poetry influences painting Life of Pi, Survival of the Fastest, Time-Maker, timeless one, vessel, vessels. Bookmark the permalink.